Help Kickstart an Awesome Book on Vipassana! Please help us raise money for this amazing book on Vipassana. Check out the kick starter for all the info. It only takes a few minutes to make your donation so please help us make this book reality. One of our founding members, Brad has been working on this book for several months and is raising money to cover his living costs so that he can finish it. Click here to go the the Kickstarter Page! Much love and In Lak’ech! We are very excited to announce our first 3-month residential retreat at In Lak’ech Village in Mazute! The main focus of the program is natural breath and natural posture in yoga, meditation and daily movement. Please see the full course description here and go here to see the daily curriculum breakdown. This is an incredible opportunity to be immersed and expand your practice and build on your ability to share your practice with others. The retreat will run July-October 2015 and spaces are limited to 6 people. Please get in touch ASAP to reserve your place. Lots going on at In Lak’ech! 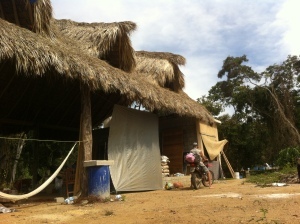 Lots of volunteers, new roads going in, and other community members getting started on their building! 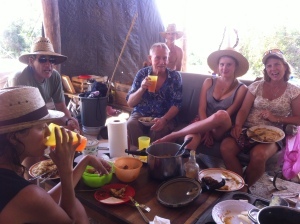 We had a beautiful Christmas lunch in the main palapa. It’s great to see the land developing and the project growing. Crazy to think that the land was purchased less than a year ago!